Claudia/Chance/Chrissy, the best episode ever. I've been talking about this one for years to anyone who'd listen. It's been posted and removed and posted and removed before. But now the internet is flooded enough that it's readily available. So let's share it again. this is the only place in the world where you actually benefit from that one day you used your nerf bow and arrow before realizing it's the worst toy ever. first jumps are perfect all around: three shots, three bulls eyes. but chucky hits a snag on the return, and gives both j.p. and sean a chance at a second shot before he even reloads. j.p. hits, but sean misses, and the miss seems to get in his head, as sean can't seem to find the return pad either. chucky continues to struggle, and even with spotter assistance can't get his rhythm back for almost a half-minute. even when he does eventually get back, he falls into the same trap, eventually floating in no-man's land. j.p., meanwhile, keeps up his perfect rhythm, and while he may miss a few shots, he never misses a beat. in the end, chucky gets a lucky one off, and sean gets his second just under the buzzer, so the two tie for second. 11-year-old chucky "the conqueror" robertson is a self-described "parent pleaser"
sean, on the other hand, is at the rings at 6 and done by 13, tiring out his legs on the cargo net, and ignoring them so they can rest on the rings--perfect execution. his bigger frame helps him on the cruise for life, and he can attack the tire crawl in a more calculated manner--he's rolling out at 24.5. he has so much momentum at the wall climb that it would be more appropriately called the "wall run." he's down the slide and in the pool by 30.4, putting chucky's numbers to shame. j.p. is up next, and sees that his early lead is in danger. he gets in his own head, looking to the rings before he's completed the cargo net, and is unable to find the netting with this feet right on the outset. he doesn't even hit the rings until 12.1 seconds, and then takes them too cautiously, ignoring his feet almost to his detriment, and treating them like monkeybars that only can be scaled with individual-swing momentum. he's at the tires at 29.9, and is now all-but officially only hoping for a 2nd place finish. he struggles through the tires, crawls to the top of the wall, and slides slowly into the pool for a 42.9 second finish. i can't believe a performance like that still got him 2nd. sean "the flyer" flynn is a 13-year-old trading card collector. ahhh--memories. wow. chucky demonstrates why he made it to the extreme arena in the first place, skimming above the water like...well...either a water bug or jesus, depending on where you like to take your guts metaphors. 7.2 seconds. bam. look at that smile. sean steps up second. good jump, but his weight is a disadvantage in this one, as it drags him into the rapids. 8.9 seconds. j.p. looks nervous going third, as even 8.9 is a tough time to beat. he tries the hopping approach, and due to a good reach, clocks in at a very impressive 7.4. not good enough for first, but it'l keep him in first overall. chucky's post event interview: "hi mom!" this one's coming down to the very end. five serves. five chances at the targets. one of the harder, more randomly determined events in the game, as the kdis aren't really strong enough to aim and hit the balls in straight lines, and they're spending too much energy just concentrating on jumping. everyone gets less air than they should, no one hits with much precision. as a viewer, you can't even really see what's going on. j.p. finishes with 3; 2 for the other two. o'malley comes into the interview with a fake head bandage from when he headed a ball before the game. HA! antics! besides just the normal fluff questions, though, he asks a good one about how hard it is to jump up. when j.p. brushes it off (as he did the rest--they can't all have sean's training), o'malley ironically reacts by mocking how dumb his own questions are. "who's got the guts to win? who's got the guts to get to the top of the mountain first?" tell 'em, mike. from the onset, it's jp v sean. maybe the glitter got to chucky, maybe he was too small to scale the rock, or maybe he just couldn't find the actuators, but by the time they go to the wide shot to show j.p. and sean's neck-and-neck finish, chucky's still at the very bottom. sean reaches up and hits the final actuator in what seems like record time, barely inching out j.p. ...that is, until we realize j.p. missed one at the beginning of the course. sean stands at top in first, watching as j.p. climbs from the top back to the bottom and back up again. if chucky can beat him, sean wins. if j.p. gets second, the game is his. j.p. gets down extremely quickly, and chucky struggles to get around the boulders (which shouldn't require a struggle). j.p. beats him up by a lot, and after he's already hit the final light, we realize chucky missed an actuator at the bottom anyway. a pathetic performance by chucky costs sean the game, and they zoom in for a closeup to see the dejection on his face. they don't get closer than this. chucky takes his bronze metal like a gentleman. sean throws his arms in the air, proud. j.p. just looks uncomfortable in success. clutch? he should be used to it. he doesn't have enough strength to hoist the crag in the air, but he does try. sean, this game should have been yours. NO IFS, ANDS, OR BUTS--THESE KIDS GOT GUTS! what a freakin' episode. 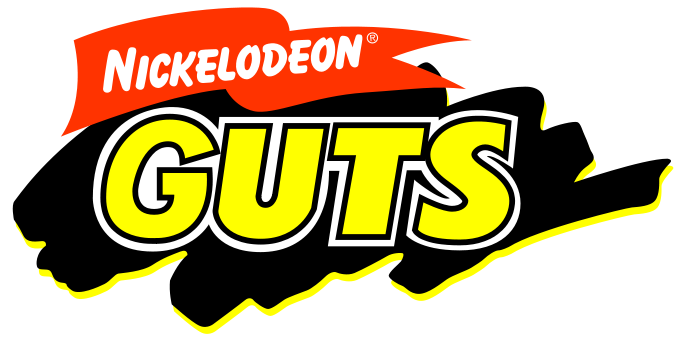 this is what guts is made for. you could see the excitement in mike's face from the instant the game started--games like this are the reason he gets up in the morning. three real athletes hungry for a glowing piece of that radical rock. event one: off the wall. mike (in blue)'s first jump is directly in the center of the wall. it is possible that he knocked off more balls with that one jump than any other single jump in guts' off the wall history has. he now, however, has a huge gap in the center of the wall and cannot really make efficient use of his remaining time with any of his following jumps since there are no sectors big enough to be worthwhile. on top of this, he has continuous trouble getting back on the aerial bridge. the event ends, and seemingly out of nowhere, justin has only 2 of his 50 balls left on the wall. 48/50. that is an unreal score. unquestionably the best score i've ever seen. the replay reveals why: he attacked the game perfectly. he went at the wall in a well-designed pattern and used every jump to its fullest. a near-flawless execution. nathan finishes with 33 and mike with 26--also two of the highest scores i have ever seen. justin's post-event interview reveals that this will most probably be the high point of his life. nathan and mike both seem to know that contact is key--they pick up on the nearly-unbeatable bunt technique, but nathan before mike. justin shows the world that he is indeed a competent baseball player, but skill in a sport doesn't always translate to the guts game that is derived from that sport. besides just employing the bunt technique before mike, nathan seemed to have better concentration while in the batter's box. he finishes with a commanding 19, handily defeating mike's 10 and justin's (quite respectable for non-bunting) 7.
what the hell is that? terminator b? was that really necessary? and one of the worst guts='s i've seen in a while. well, combat's good for our next event, because our next event is a post-nuclear race that really gets in your face. it's "mad max": a frantic dash through all sorts of terrain! --look out for the stray tires LETS GO TO MO FOR THE RULES--MO! they used the prop-master's self-powered-tail-lights bike for this one. not exactly the best use of these three athletes, but, still, a fun and rare event-type never hurts an episode. in a weird foreshadowing, mike warns about taking the course too fast right before justin goes. justin naturally goes too quickly and loses control, both costing him off-the-track penalties and forcing him to run into the side of the crash finish instead of through it at first. again--his 48/50 was indeed the high point of his life. it was all down hill from there. nathan takes first with 17.5 seconds, mike second with 18.9, and justin third with a generous 26.6.
the dreaded fourth hurdle. for some reason, people never have problems with the second (although sometimes they miss the first--and usually they miss the second--aerial bridge) hurdle, even though in theory they should be equally as challenging. i guess it's a rhythm thing. mike starts and as predicted does incur 5 second penalty for knocking down the fourth hurdle. 23 seconds even. justin looks fantastic up until the first aerial bridge and then gets overexcited, coming off too fast. he winds up overshooting the third hurdle and he finds himself taking the fourth too quickly. he can't back out, and he crashes directly into it. he forgets that the game is not over, though, and lethargically hangs for almost a full second before trying to finish. 24.7.
nathan has trouble with the first bridge and gets spotter help. he too knocks the fourth hurdle down, and finishes with 45.6 (including the hurdle and two five-second assistant penalties). going into the crag we have an unreal game. baring missed actuators we're in for one helluva ride. as predicted, the crag is a memorable one. all three handle boulder canyon like it's child's play. three athletes at the peak shape of their guts-eligible lives scale our rock in near-perfect sync. they reach the final vertical-climb at nearly the same exact time--the entire game comes down to this. nathan reaches the top first, right as justin is slipping. he falls and mike takes advantage of the opportunity. he jumps ahead of justin to claim second. one of the greatest games i've ever seen played.